The Lughnasagh (or Lughasad / Lúnasa / Lughnasadh…) games, inaugurated by Lugh in honour of his foster mother, may be of as old a lineage as the Olympic games. Twenty one years ago, I thought it might be a good idea to create our own modern version of the games on my own land at Teach Shinanna. The main issue was that Iarnród Éireann didn’t encourage the carrying of spears on trains and it was hard to get insurance for chariots, even third party fire and theft! A new approach was required. So, the Coming of Lugh to Tara was invoked, and each year, an Ildánach was selected who could prove herself, or himself at the testing. However, the tasks were thoroughly re-defined. The Feat of Fleetness of Foot: This game began as a race around the parameter of the circle with the combatants travelling in opposite directions. The task of passing your opponent could be tackled in any way you liked. This lead to the idea that creative cheating was allowed; as long as the letter of the law was kept and that each “cheat” could only be used once. This game has remained popular. The Feat of Bardship: This feat is awarded to the person telling the best joke or anecdote. I have heard that some entrants plan for their Lughnasagh joke throughout the year! The winner is frequently chosen by any children present. The feat of Lugh: The final feat recalls the “stance of Lugh” as he taunts the Fomoire at the battle of Moytura. It is said he stood on one foot with one eye closed and one hand raised above his head. All participants hold this stance as long as they can. Those who fail in the task can distract those who still stand in whichever way they like, as long as it does not involve touching. Super-soakers have proved popular! In spite of this, the record stands at one and a half hours! Other games have been tried, but everyone always wants the old games back. Over twenty years, numbers have varied. There have been numbers from 35 to more than 100 guests. We have included visitors from all over the world, including, one year, George Martin. Some years we need separate children’s heats. Some years it is hot and some years it is wet, but the Lughnasagh games go on. There will be another Ildánach appointed in 2013. In the early years of the new millennium, Isolde and I (with Christophe and Ritchie) launched a Performance Arts Group called Hit & Myth. 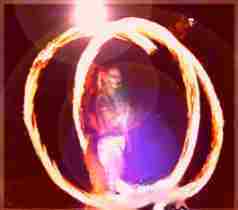 We undertook magnificent fire shows and a wide variety of story-telling and magic shows, but central to our repertoire were shows based on Irish Mythology. The first, called “Immortal Kombat”, was a show in which we introduced Irish characters and their stories, setting them against each other in Mortal Kombat style. It was great fun and introduced some famous story characters in an unusual way. The second show, “Once upon a Time in the West (or the approximately 5 1/2 invasions of Ireland)”, was our take on “The Book of Invasions”. This image shows our version of the fight between Balor and Lugh. This show had elements of Irish as well as lots of comedy, chaos and fire combat and, I think, was my favourite show. I had always wanted to see a re-enactment of the whole saga of Moytura on the actual site. 2000 seemed an ideal year for this. Thanks to the support of local community groups, such as C.L.A.S.P. (The Community of Lough Arrow Social Project), it was possible to raise the funding for a three-day festival. It was very special, with community projects throughout the year. There were wonderful embroidered hangings made by older members of the community; a major cross border project which involved me writing and directing a play, “Strength in Everyone”, with local young people for performance in the North of Ireland. We had school workshops and also trained local people to fight in the battle re-enactment. Isolde and I spent much time on the script, and it was because we had difficulties with some of the untranslated Old Irish poetry that Isolde later went off to Trinity to undertake a Masters in Early Irish. During the festival there were guided walks and tours, living history exhibitions, falconry, arts and craft exhibitions, bands and music. Hit & Myth gave a fire-show (one of our hour-long choreographed shows). Central, of course, was the re-enactment of the battle, with the Fomoire arriving by boat, and the whole story told on the field. I will never forget the honour of standing on the field as the Morrigan, as she delivers the prophecies that follow the battle. On the Sunday evening, the entire saga was told by a group of seven story-tellers, each speaking in their own style, some accompanied by harp. There were many challenges to creating the festival, but it remains a high point of my life.